You’ve heard of sponsored content, where a site publishes an ad that looks like an article. But there’s a whole class of content that’s not paid for, but in which the author is an industry player with a vested interest in spinning the information. Let’s call it spinsored content. … continues to hold its ground in the U.S. while the rest of the world has embraced Android. Speculation suggests that Apple’s closed ecosystem is slowly losing to Android on the back of Android’s commanding 78.1 percent global market share, according to the IDC. When you look at the iPhone’s share of global phone sales, you can see how precipitous its decline is. Wait, that’s not what that graph shows. Huh. Weird. Of course, Apple isn’t going anywhere. 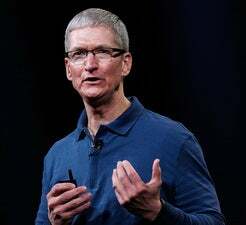 But during Apple’s Q1 2014 earnings call, the Wall Street Journal managed to get Tim Cook to divulge something about Apple’s struggles with the U.S. market. “North America was a challenge. We had no growth,” Cook said. And why is that? It’s because Apple’s pretty much saturated. The iPhone is on all the major carriers now, and the only room for growth is picking away at Android. For instance, did you Apple dorks know that you can solder a camera onto a phone? Well, it’s true. It’s an abomination of nature, but it’s true. Stop, stop, ugh, stop. There’s nothing game-changing about any of these devices. Look at the reviews. The Galaxy S5 was met with a resounding “meh.” HTC makes the nicest phones … that nobody buys. The Moto X flopped. Phones have reached a maturity level that’s marked by incremental improvements. All of them. … and with technology increasingly intertwined with our lives, a couple of factors in play will contribute to Android’s chance at running away with the U.S. mobile-device market share. Now, with a heightened awareness of the tech behind a smartphone, Android’s customizability will become increasingly attractive to the growing number tech-savvy smartphone users, among which could be ex-iOS users. Uh-huh. Because if there’s anything we know it’s that people don’t like their iPhones and want to switch wait, nope, that’s not right. In parallel, while Apple convinced consumers to buy into a brand that happened to be sold at a premium, emerging Android hardware manufacturers from the East, such as Xiaomi, Zoppo, OnePlus and others are managing to replicate the fanaticism Apple’s users once had. We did have an all-time revenue record in Greater China, just under $10 billion at $9.8 billion. iPhone sales were up 28%, that’s versus the IDCs market forecast of 20% growth. So we gained share. Yes, the brands Shen mentions have done phenomenally well in China. But they haven’t had to compete against the iPhone on an even footing. The Macalope doesn’t expect the iPhone to reach the same market share in China that it has in the U.S. or Japan, but declaring that because these other brands succeeded in China, they’ll succeed in the same way in the U.S. is crazytown bananapants. They may do well, but if so it’ll mostly be at the expense of other Android manufacturers, not Apple. So, how do we explain Shen’s argument? While PapayaMobile’s ad network works on iOS as well as Android, it might have a vested interest in Android taking more market share in the U.S. as ad-based apps are more popular on Android. But it definitely has a vested interest in saying wacky, negative things about Apple in order to get traffic to its site and to try to attract Android developers. Aaaand that’s why there’s no link.